Wasps director of rugby Dai Young says they expect Wales full-back Leigh Halfpenny to decide on his future in the next couple of weeks. Halfpenny, 27, could leave French club Toulon in the summer and Wasps are among the clubs interested in him. "We would obviously love to have [him]," Young told BBC Coventry and Warwickshire. "We're probably one of six or seven options Leigh's got." 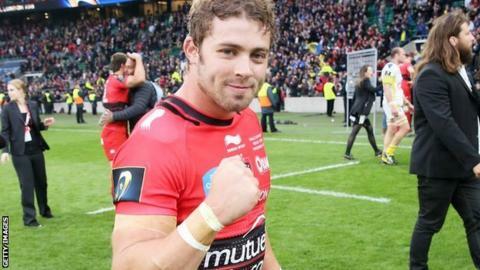 Halfpenny signed a two-year deal when he joined Toulon in January 2014. The British and Irish Lions full-back is currently recovering from the knee injury that kept him out of this year's Rugby World Cup. Cardiff Blues and Scarlets are keen to bring the player back to Wales, but it is Premiership Wasps who appear to have emerged as favourites for his signature. "I couldn't say what Leigh's going to do, but I know he's looking to make a decision over the next two weeks and we're one of the clubs that's an option," Young said. Wales have adopted the so-called Gatland's Law, under which players based in the the country would be favoured for international selection. However, national team coach Warren Gatland can make exceptions. "I'm sure that's something Leigh will consider," added Young. "International rugby and playing for Wales is a big part of the agenda."